Everything you need, you find it here!!! Use sterilized container. 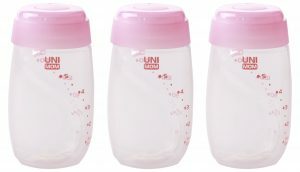 Opt for plastic bottle or breast milk storage bags. Glass bottles may crack or chip. Air-con temperature (no more than 25 degrees), for up to six hrs. In a cool box / bag, with ice packs, for up to 24 hrs. In a fridge (4 degrees or colder), up to five days. Store it at the back of the fridge, where it’s coldest and away from other foods. In a fridge’s freezer compartment, for up to six months. Store in refrigerating or freezer level? Where to store your breast milk depends on how soon you want to use it. If you plan to use it within a few days, it is better to store in refrigerating level. If you are going to feed your baby, at least 5 days later is better to store in freezer level. Can I mix different batches of expressed breast milk? Yes, you can add freshly expressed breast milk to your previously expressed breast milk; provided is on the same day. There are “2 layers” of breast milk. It is normal? If your milk has been stored for some time, you may notice that it separates into 2 or maybe more layers. This is normal, just give it a gentle shake to mix it up again!!! How to warm the breast milk in an effective way? You know how much your baby will drink in a day. So plan ahead! For example, you can shift the daily amount of breast milk that your baby needs from the freezer to refrigerating level one night before. Then, warm thawed milk by holding the bottle or breastmilk storage bag under warm running water to quickly thaw. Do not use hot water. To preserve the full nutritional of the breastmilk is to avoid overheating. The temperature is approximately at or a bit below body temperature (98.6 F / 37 C). Alternatively, you can use a bottle warmer but remember not to overheat it. Can I refreeze my breast milk again? Do not refreeze breast milk again once it is thawed or partially thawed! Breast milk left in a feeding container after a feeding should be discarded and not used again. Baby’s Friends Breastmilk Storage Bag is presterilised and they are ready to use straight from the box. The leak-proof ziplock guarantees easy opening and closing. 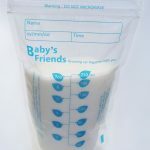 Each individual of Baby’s Friends Breastmilk Storage Bag has a double layered. Not only does this make them virtually leak proof – it also ensures that the nutrients of breast milk are well preserved. The bags are self standing and have easy to ready measurement indicators up to 210ml or 7 Oz as well as a label to record the date and time of expressing. 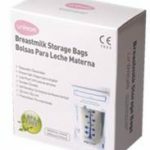 Standard breast milk storage bag 125pcs of Milkbags. Advanology has been selling Unimom product since 2008. We know Unimom best than anyone else in Singapore. We are working to offer a special offer for Unimom supporters in Singapore. Let us know if we are not the cheapest!!! We are sure we are !!! 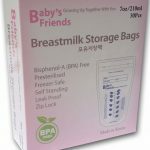 Thermal Sensor breast milk storage bag 100pcs of Milkbags. Let us know if we are not the cheapest!! !